Mcinnis, Peter S. et al. "Annapolis Royal". The Canadian Encyclopedia, 14 July 2016, Historica Canada. https://www.thecanadianencyclopedia.ca/en/article/annapolis-royal. Accessed 23 April 2019. Annapolis Royal, NS, incorporated as a town in 1893, population 481 (2011c), 444 (2006c). The Town of Annapolis Royal is located on the south side of the Annapolis River, about 10 km from its mouth near the western shore of Nova Scotia. The entire basin was named Port-Royal by Samuel de Champlain and Pierre du Gua de Monts when they discovered the area in 1604. The site was amenable for settlement, offering a temperate climate and arable land, and was perfect for military purposes, protected by surrounding hills. 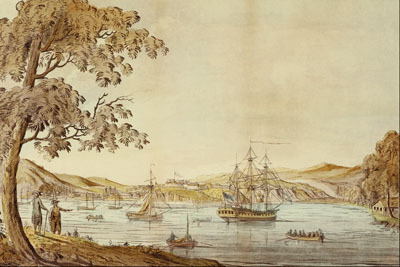 View of the town and fort of Annapolis Royal, watercolour by J. Hamilton (courtesy Library and Archives Canada/C-2706). Fort Anne was begun in 1687 and after its completion was strong enough to stave off 2 invasions from New England colonials in 1704 and 1707 (painting by J.F.W. Des Barres, 1781, courtesy Library and Archives Canada/C-002705). 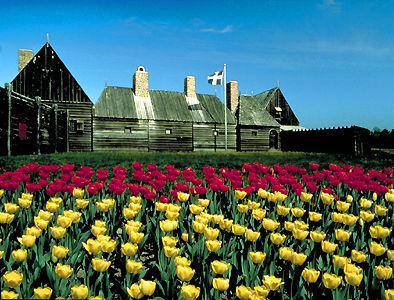 Jean de Biencourt de Poutrincourt established a small group of farmers there in 1606 and Acadian settlement spread slowly along the basin and river. The habitation was destroyed in 1613 by Samuel Argall and William Alexander erected a fort at present-day Fort Anne, 15 km upriver, in 1629. In 1632 the fort was ceded to the French, and in 1636 it was assigned to Charles de Menou d'Aulnay, who transferred most of the population of Acadia to the area. The fort was rebuilt in 1643 in response to an attack by Charles de La Tour. It was captured by Robert Sedgwick in 1654 and reoccupied by the French in 1670. A new fort was begun in 1687 and after its completion was strong enough to stave off 2 invasions from New England colonials in 1704 and 1707. Francis Nicholson changed the name to Annapolis in honour of Queen Anne when he captured the fort in 1710, and the fort was garrisoned until 1854. 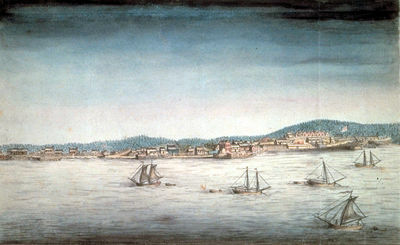 The settlement was the capital of Nova Scotia until the founding of Halifax in 1749. After the deportation of the Acadians, the area was resettled by New Englanders and Loyalists. The old and new names gradually merged to become the official name, Annapolis Royal. Shipping became an important industry in the 19th century, with timber an important export, and an ironworks was established. Tourism is the town's main industry. Fort Anne was restored and in 1917 became Fort Anne National Historic Park, Canada's first national historic site. 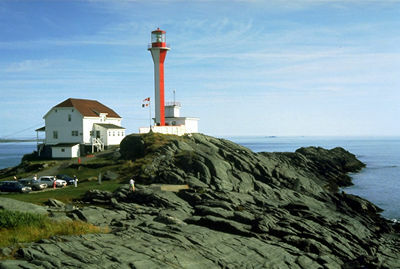 With nearby Port-Royal, also a historic site, the town attracts some 100 000 visitors each year. Much of the downtown area is a restoration of the mid-1700s period. A Victorian streetscape, the Historic Gardens and King's Theatre during the summer months are further attractions. Annapolis Royal is also the site of the only modern tidal electrical generating plant in North America, built 1980-84. The plant takes advantage of the Bay of Fundy's tides - the highest in the world - to generate enough electricity to power 4500 homes. The Tidal Power Interpretative Centre provides visitor information. Annapolis RoyalThe website for the Town of Annapolis Royal, Nova Scotia, the first capital of the Colony of Nova Scotia. A good resource for information about local history and heritage.